Australian Television Show Promotes Tropical Artists. Australian Television Show Features Tropical Artists. Australian television show, 'Put Some Colour in Your Life' is gaining in popularity as people across the nation learn about it. 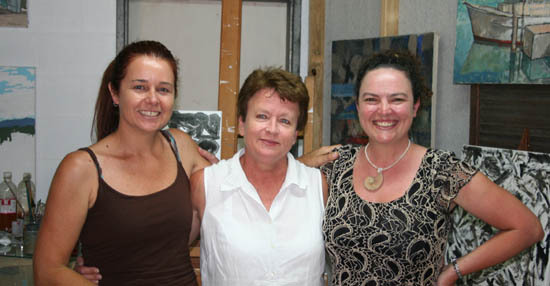 Their small filming team, comprising Graeme, Sophia and Amelia, visited Port Douglas, North Queensland in November 2012, to film artists in their studios. The concept of the series is an educational one, aimed at interested viewers and budding artists but it also works brilliantly as a promotional tool. Featured artists are usually delighted to find that sales of their artworks soar following the airing of their segment. 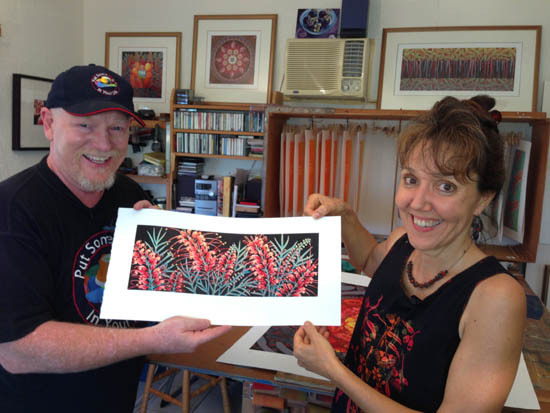 Port Douglas artists promote art and the region on Australian television. As well as showcasing their artwork, this particular Australian television series also shows the beautiful area around Port Douglas, where artists live, and which enriches their experience and provides inspiration for their interpretation of it. Artists' studios are often hidden away in scenically stunning locations but are not usually accessible to the public. So here's your chance to take a peek inside! 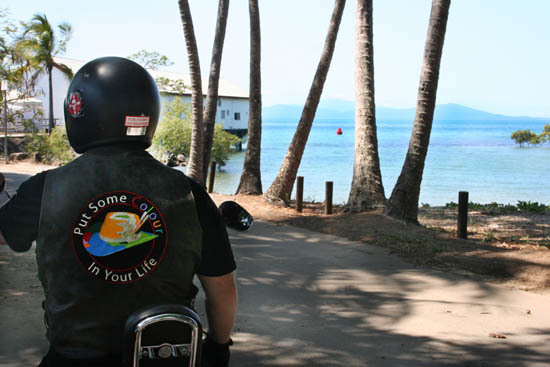 Graeme and trusted Harley Davidson (courtesy Choppers, Cairns) surveys Port Douglas inlet. The film crew chats with artists as they paint, print or sculpt, demonstrating various working methods and skills – perhaps oil painting techniques, how to draw people, construct a clay portrait sculpture, make realistic horse drawings or etchings and so on. Artists share their skills and inspiration. As the conversation proceeds the Australian television audience across the country learns something about the artist’s interests and inspirations and is treated to a short portfolio of past works. It is a friendly and relaxed experience, due, in large part, to the ability of Graeme Stevenson, the show’s principal, to draw artists out (excuse the pun!) as he gently questions them and leads them into discussions about themselves and their work. Graeme and Anna hold the reduction lino print, finished during the filming session. The show airs on Channel 4ME or 74 at 7pm Australian Eastern time (6pm in Summer in Queensland because of that state’s non-involvement in daylight saving) and is repeated during the week. It also currently airs in New Zealand, with England and possibly US and China to follow next year. Artists living in the Port Douglas region are usually inspired by their surroundings so we have named this series 'Through Artists' Eyes' as it showcases the area through the eyes of its highly skilled painters, print-makers, glass artists and sculptors. 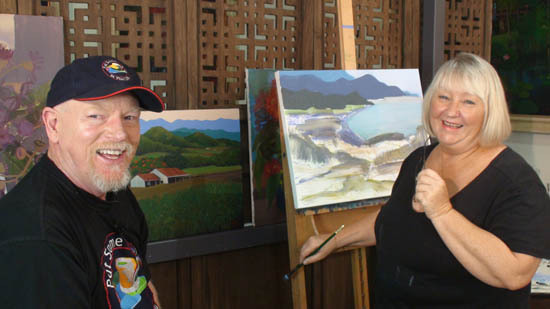 Graeme watches Tania working on a new painting of the Daintree coast - they seem to be enjoying themselves! Making art is usually a solitary occupation, requiring intelligence, skill, dedication and perseverance. Most practitioners have gained formal qualifications through tertiary institutions - but some have learned through 'the school of hard knocks' or through constant practice and experience. In general they constantly strive to improve and to explore various ideas and subjects, an aspect which is of great interest to collectors, who follow their careers. 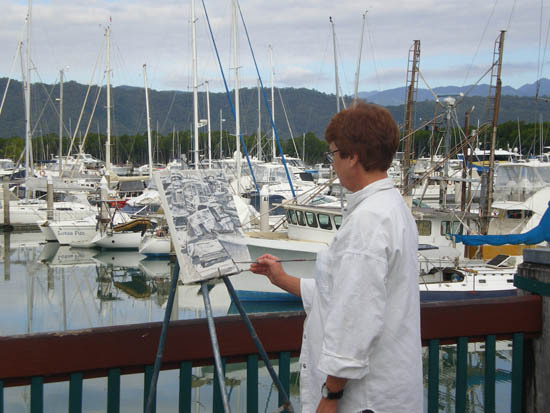 Mary Ann works on a favourite subject of hers - boats in Port Douglas Marina. Our 'trailblazers' for this first stage of the Tropical Series of 'Put Some Colour in Your Life' have done a wonderful job of sharing their professional lives, skills and ideas with us all. We thank them all for helping to promote the art, artists and beauty of this special region of Australia. They are Anna Curtis, Tania Heben and Mary Ann Runciman. Mary Ann with camera crew Amelia and Sophia, during a break in filming in her studio. The Tropical series went to air in early March. Repeats are shown from time to time or can be viewed on the Colour in Your Life website or on this page. Channel 74 (4ME) 7pm Eastern Daylight Savings time to view other Australian artists. 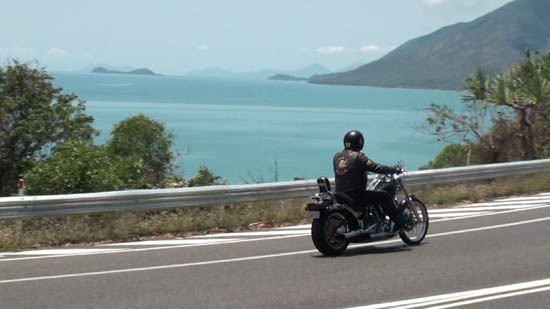 The coast road between Cairns and Port Douglas, Double Island in the distance.